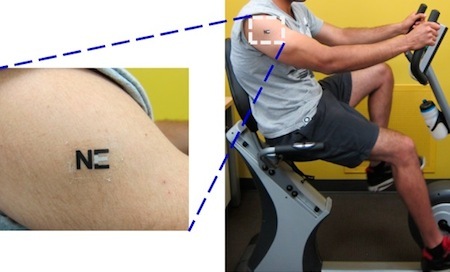 A handy real-time electrochemical biosensor in tattoo form has been developed to let extreme athletes know when they are about to 'hit the wall' metabolically. The sensor monitors lactate, a form of lactic acid released in sweat. Lactate forms when the muscles need more energy than the body can supply from the “aerobic” respiration that suffices during mild exercise. The body then shifts to “anaerobic” metabolism, producing lactic acid and lactate. That helps for a while, but lactate builds up in the body, causing extreme fatigue and the infamous “bonking out,” where an athlete just cannot continue. Tests on 10 human volunteers showed that the sensor accurately measured lactate levels in sweat during exercise. “Such skin-worn metabolite biosensors could lead to useful insights into physical performance and overall physiological status, hence offering considerable promise for diverse sport, military, and biomedical applications,” say the scientists. Current methods of measuring lactate are cumbersome, require blood samples or do not give instant results. 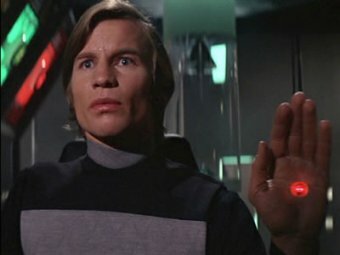 This device reminds me of the palm flower from the 1967 novel Logan's Run. In the case of the novel, though, the device warns about life stages, and of course, the ultimate wall.